Sketch voltage and current versus time in simple inductive, capacitive, and resistive circuits. Calculate inductive and capacitive reactance. Calculate current and/or voltage in simple inductive, capacitive, and resistive circuits. Many circuits also contain capacitors and inductors, in addition to resistors and an AC voltage source. We have seen how capacitors and inductors respond to DC voltage when it is switched on and off. We will now explore how inductors and capacitors react to sinusoidal AC voltage. Suppose an inductor is connected directly to an AC voltage source, as shown in Figure 1. It is reasonable to assume negligible resistance, since in practice we can make the resistance of an inductor so small that it has a negligible effect on the circuit. Also shown is a graph of voltage and current as functions of time. Figure 1. (a) An AC voltage source in series with an inductor having negligible resistance. (b) Graph of current and voltage across the inductor as functions of time. When a sinusoidal voltage is applied to an inductor, the voltage leads the current by one-fourth of a cycle, or by a phase angle. with the frequency of the AC voltage source in hertz (An analysis of the circuit using Kirchhoff’s loop rule and calculus actually produces this expression). is called the inductive reactance, because the inductor reacts to impede the current. has units of ohms ( , so that frequency times inductance has units of (cycles/s)( )= ), consistent with its role as an effective resistance. It makes sense that is proportional to , since the greater the induction the greater its resistance to change. It is also reasonable that is proportional to frequency , since greater frequency means greater change in current. That is, is large for large frequencies (large , small ). The greater the change, the greater the opposition of an inductor. (a) Calculate the inductive reactance of a 3.00 mH inductor when 60.0 Hz and 10.0 kHz AC voltages are applied. (b) What is the rms current at each frequency if the applied rms voltage is 120 V? The inductive reactance is found directly from the expression . Once has been found at each frequency, Ohm’s law as stated in the Equation can be used to find the current at each frequency. The inductor reacts very differently at the two different frequencies. At the higher frequency, its reactance is large and the current is small, consistent with how an inductor impedes rapid change. Thus high frequencies are impeded the most. Inductors can be used to filter out high frequencies; for example, a large inductor can be put in series with a sound reproduction system or in series with your home computer to reduce high-frequency sound output from your speakers or high-frequency power spikes into your computer. Note that although the resistance in the circuit considered is negligible, the AC current is not extremely large because inductive reactance impedes its flow. With AC, there is no time for the current to become extremely large. 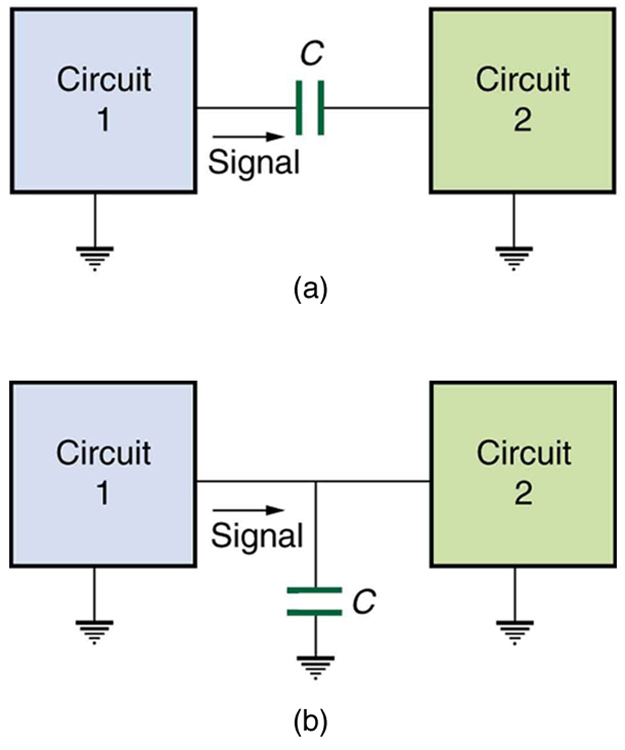 Consider the capacitor connected directly to an AC voltage source as shown in Figure 2. The resistance of a circuit like this can be made so small that it has a negligible effect compared with the capacitor, and so we can assume negligible resistance. Voltage across the capacitor and current are graphed as functions of time in the figure. Figure 2. (a) An AC voltage source in series with a capacitor C having negligible resistance. (b) Graph of current and voltage across the capacitor as functions of time. When a sinusoidal voltage is applied to a capacitor, the voltage follows the current by one-fourth of a cycle, or by a phase angle. where is called the capacitive reactance, because the capacitor reacts to impede the current. has units of ohms (verification left as an exercise for the reader). is inversely proportional to the capacitance ; the larger the capacitor, the greater the charge it can store and the greater the current that can flow. It is also inversely proportional to the frequency ; the greater the frequency, the less time there is to fully charge the capacitor, and so it impedes current less. (a) Calculate the capacitive reactance of a 5.00 mF capacitor when 60.0 Hz and 10.0 kHz AC voltages are applied. (b) What is the rms current if the applied rms voltage is 120 V? The capacitive reactance is found directly from the expression in . Once has been found at each frequency, Ohm’s law stated as can be used to find the current at each frequency. The capacitor reacts very differently at the two different frequencies, and in exactly the opposite way an inductor reacts. At the higher frequency, its reactance is small and the current is large. Capacitors favor change, whereas inductors oppose change. Capacitors impede low frequencies the most, since low frequency allows them time to become charged and stop the current. Capacitors can be used to filter out low frequencies. For example, a capacitor in series with a sound reproduction system rids it of the 60 Hz hum. Although a capacitor is basically an open circuit, there is an rms current in a circuit with an AC voltage applied to a capacitor. This is because the voltage is continually reversing, charging and discharging the capacitor. If the frequency goes to zero (DC), tends to infinity, and the current is zero once the capacitor is charged. At very high frequencies, the capacitor’s reactance tends to zero—it has a negligible reactance and does not impede the current (it acts like a simple wire). Capacitors have the opposite effect on AC circuits that inductors have. Figure 3. (a) An AC voltage source in series with a resistor. (b) Graph of current and voltage across the resistor as functions of time, showing them to be exactly in phase. When a sinusoidal voltage is applied to a resistor, the voltage is exactly in phase with the current—they have a phase angle. For inductors in AC circuits, we find that when a sinusoidal voltage is applied to an inductor, the voltage leads the current by one-fourth of a cycle, or by a phase angle. The opposition of an inductor to a change in current is expressed as a type of AC resistance. where is the rms voltage across the inductor. with the frequency of the AC voltage source in hertz. Inductive reactance has units of ohms and is greatest at high frequencies. For capacitors, we find that when a sinusoidal voltage is applied to a capacitor, the voltage follows the current by one-fourth of a cycle, or by a phase angle. where is the rms voltage across the capacitor. has units of ohms and is greatest at low frequencies. 1: Presbycusis is a hearing loss due to age that progressively affects higher frequencies. A hearing aid amplifier is designed to amplify all frequencies equally. To adjust its output for presbycusis, would you put a capacitor in series or parallel with the hearing aid’s speaker? Explain. 2: Would you use a large inductance or a large capacitance in series with a system to filter out low frequencies, such as the 100 Hz hum in a sound system? Explain. 3: High-frequency noise in AC power can damage computers. Does the plug-in unit designed to prevent this damage use a large inductance or a large capacitance (in series with the computer) to filter out such high frequencies? Explain. 4: Does inductance depend on current, frequency, or both? What about inductive reactance? 5: Explain why the capacitor in Figure 4(a) acts as a low-frequency filter between the two circuits, whereas that in Figure 4(b) acts as a high-frequency filter. Figure 4. Capacitors and inductors. Capacitor with high frequency and low frequency. 6: If the capacitors in Figure 4 are replaced by inductors, which acts as a low-frequency filter and which as a high-frequency filter? 2: What value of inductance should be used if a reactance is needed at a frequency of 500 Hz? 3: What capacitance should be used to produce a reactance at 60.0 Hz? 4: At what frequency will an 80.0 mF capacitor have a reactance of ? 5: (a) Find the current through a 0.500 H inductor connected to a 60.0 Hz, 480 V AC source. (b) What would the current be at 100 kHz? 6: (a) What current flows when a 60.0 Hz, 480 V AC source is connected to a capacitor? (b) What would the current be at 25.0 kHz? 7: A 20.0 kHz, 16.0 V source connected to an inductor produces a 2.00 A current. What is the inductance? 8: A 20.0 Hz, 16.0 V source produces a 2.00 mA current when connected to a capacitor. What is the capacitance? 9: (a) An inductor designed to filter high-frequency noise from power supplied to a personal computer is placed in series with the computer. What minimum inductance should it have to produce a reactance for 15.0 kHz noise? (b) What is its reactance at 60.0 Hz? 10: The capacitor in Figure 4(a) is designed to filter low-frequency signals, impeding their transmission between circuits. (a) What capacitance is needed to produce a reactance at a frequency of 120 Hz? (b) What would its reactance be at 1.00 MHz? (c) Discuss the implications of your answers to (a) and (b). 11: The capacitor in Figure 4(b) will filter high-frequency signals by shorting them to earth/ground. (a) What capacitance is needed to produce a reactance of for a 5.00 kHz signal? (b) What would its reactance be at 3.00 Hz? (c) Discuss the implications of your answers to (a) and (b). In a recording of voltages due to brain activity (an EEG), a 10.0 mV signal with a 0.500 Hz frequency is applied to a capacitor, producing a current of 100 mA. Resistance is negligible. (a) What is the capacitance? (b) What is unreasonable about this result? (c) Which assumption or premise is responsible? Consider the use of an inductor in series with a computer operating on 60 Hz electricity. Construct a problem in which you calculate the relative reduction in voltage of incoming high frequency noise compared to 60 Hz voltage. Among the things to consider are the acceptable series reactance of the inductor for 60 Hz power and the likely frequencies of noise coming through the power lines. 23.11 Reactance, Inductive and Capacitive by OpenStax is licensed under a Creative Commons Attribution 4.0 International License, except where otherwise noted.